One of my New Year's resolutions was to engrave a Reverso this year--with an engraving that meant a great deal to me personally. 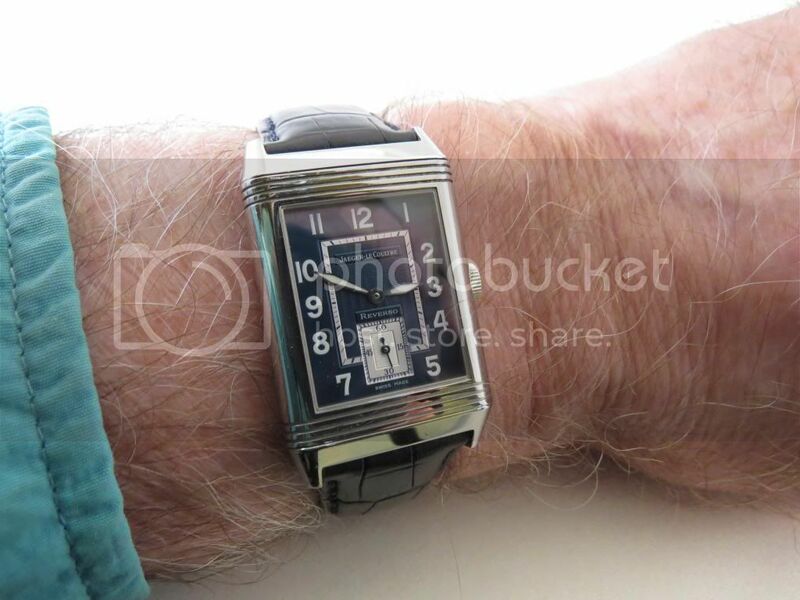 I already owned a Grande Reverso 976 which I wear frequently. The 976 has an exhibition back, so it was not the candidate for this engraving. 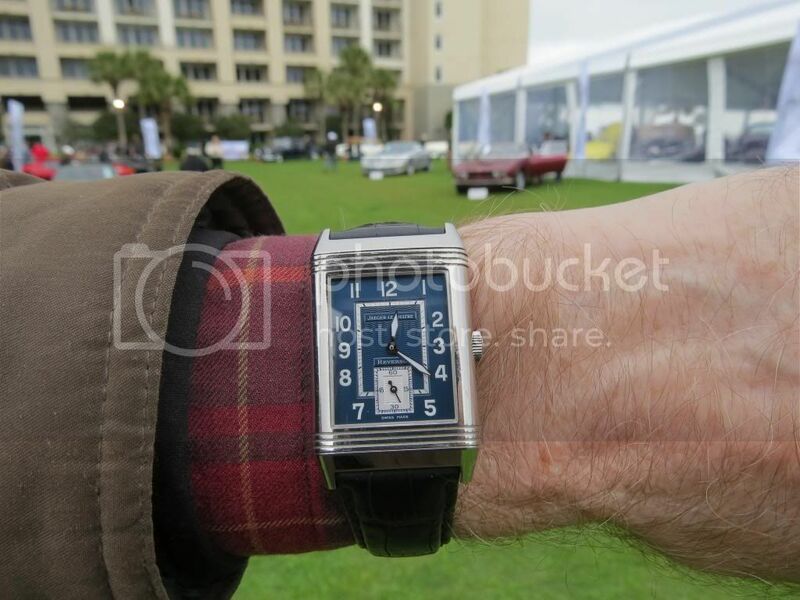 In January, I began my search for a second Reverso, one with an iconic solid reverse side--Grande Taille class. 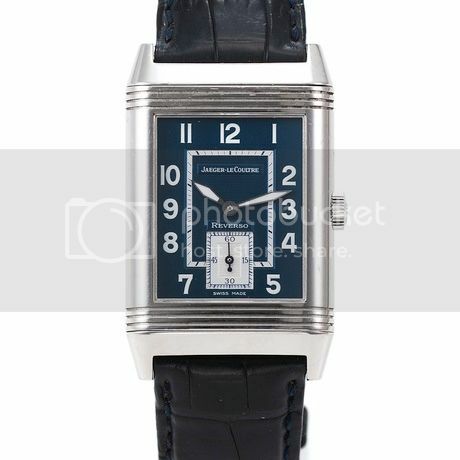 While looking for a standard Grande Taille, I came across a multi-colored blue dialed Reverso that I had not seen before--a Reverso Latitude (announced on 2003 and produced in limited numbers for a few years). Instantly, I knew this was the watch. This Latitude's blue dial would make it an even better match for the intended engraving. 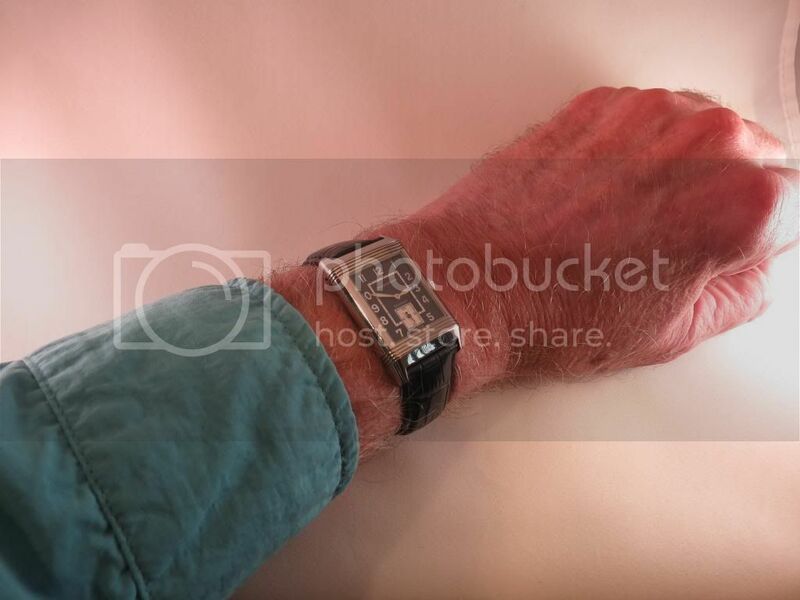 I acquired this Reverso Latitude at the Antiquorum Auction in Hong Kong in Feruary (Below is Antiquorum's excellent catalog photo that reeled me in). I did this online, live, competing with two other bidders from the Pacific Rim. You would think I won the lottery. In some ways, I did. When the Latitude arrived, it turned out to be far more attractive than the single straight-on, frontal catalog photo in the well done Antiquorum virtual catalog--it had richer blues, much more relief, much more detail--quite a pleasant surprise. The Latitude, an extraordinary timepiece in its pristine offered state, is a Grande Taille in size and still retains the smooth caseback--a perfect canvas for engraving. Once I had the Latitude in hand, I went through all the second guessing you might expect because the watch itself is so unique and the dial so beautiful and well detailed. The Latitude was already a work of art in my view, and I was about to alter it forever. 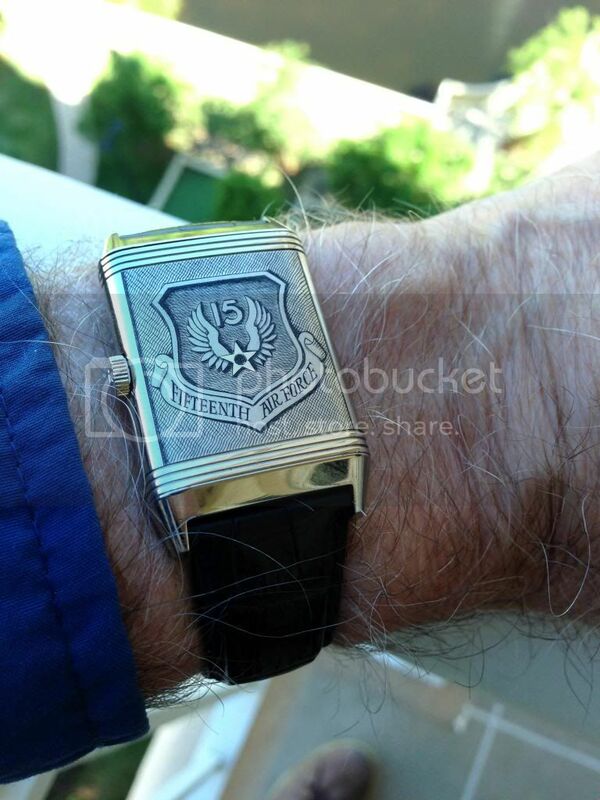 Second thoughts prevailed for two weeks, while I enjoyed the newly acquired watch for what it was. But then the original idea won out. Reason: Fate. The multi-colored blue dial was the ideal complement for the intended engraving. From the moment I first saw it, in my mind, the blues of the Latitude's dial were Air Force Blues. The Wild Blue Yonder, if you will. The engraving was to be a bit of special Air Force heraldry. 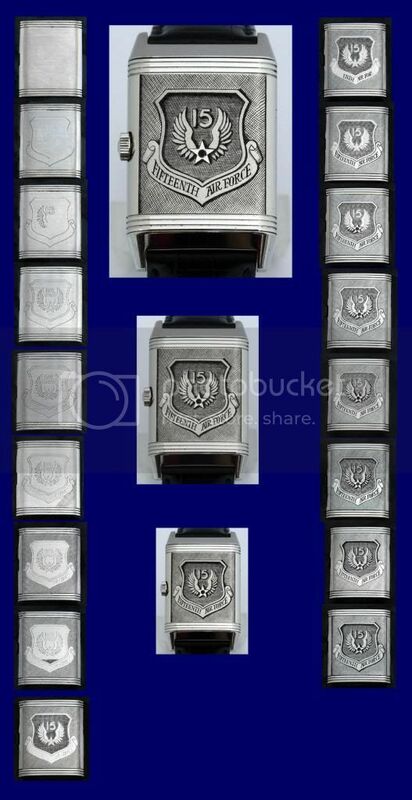 The 1930s origins of the Reverso and the 1940s WWII origins of the engraved heraldy were strong complements to each other. At the recommendations of TZers right on this JLC Forum, I contacted J C Randell, JLC's authorized bespoke master engraver, residing in Spokane. From the outset, I knew I had encountered a true artist. JC made it clear that, together, through his collaborative process, we would iterate until we were both satisfied with the intended engraved art that would adorn this Latitude. And so we began. JC had never done a specific Air Force Heraldry subject, but in his 40 years of experience, he had done far more elegant and challenging works of art. I was the novice here--I have never done "a J C Randell engraved masterpiece." J C was responsive, creative, and always available. It turned out that he uses the same philosophy as I did in the Air Force: Open, Honest, Candid, Early. So we were both totally comfortable in collaboration. Immediately, on his own, J C took the time to educate himself on the rigid protocols of Air Force heraldry. In turn, I had to learn the limits of the Golden Ratio and proportionality. 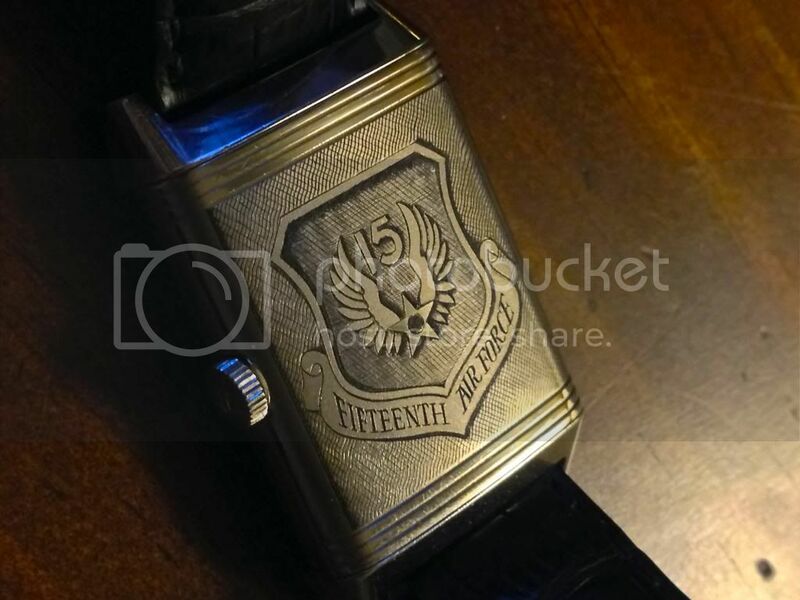 The engraved art is the official crest of The 15th Air Force, founded in 1943. General Jimmy Doolittle was its first commander. Fifteenth Air Force is often called, "Doolittle's Own." Along with the Mighty Eighth Air Force and Ninth Air Force, Fifteenth Air Force helped the US and its Allies prevail in the skies over European Theater in WWII (for example, it was 15 AF that was central to the Ploestig. Fifteenth Air Force has continued to distinguish itself as part of the U.S. Air Force ever since. I served in 15 AF and had the privilege to interact with many of the men and women who wore the 15 AF patch on their uniforms. The engraving is a true and totally accurate representation the official 15th AF crest as it was when I served in 15th Air Force in the 1990s. As such, the original 15th AF markings lie within the standard outer shield and scrolled lettering below. Once we settled on a final design, JC said, "Okay, I'll take it from here and make it even better. Trust me to do that. It is what I do." At this point in the process, you know that he is absolutely correct. So I mailed J C the Latitude. Five weeks later, J C mailed it back. I had expectations, of course. But J C exceeded those expectations by a wide margin. His "adds" were amazing--the precision, the Guilloche background, the relief--truly amazing. I spent the first few days stealing away alone to view it under all light conditions (my favorite is viewing it under a medium intensity standard desk lamp which gives it a rich golden hue). 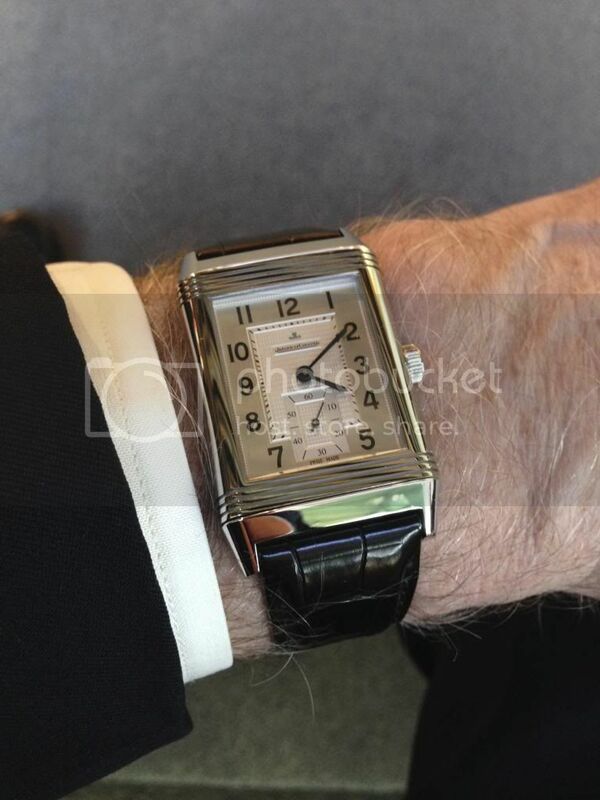 J C works with the Reverso itself. He adds nothing but the Master's Art. His art is black and white. Essentially, like a sculptor working in stone, he removes the metal to create his art. But, oh what art it is. Here is the photo sequence J C sent me to show just a few of the steps he took along the way on this bespoke masterpiece. Look at how he creates relief and dimensionality. Look at how he creates the Guilloche background--a time consuming effort requiring many hours by itself. Look at how he creates the shading within the crest. Here is the final work of art that lies quietly protected on the inside caseback of The Latitude. 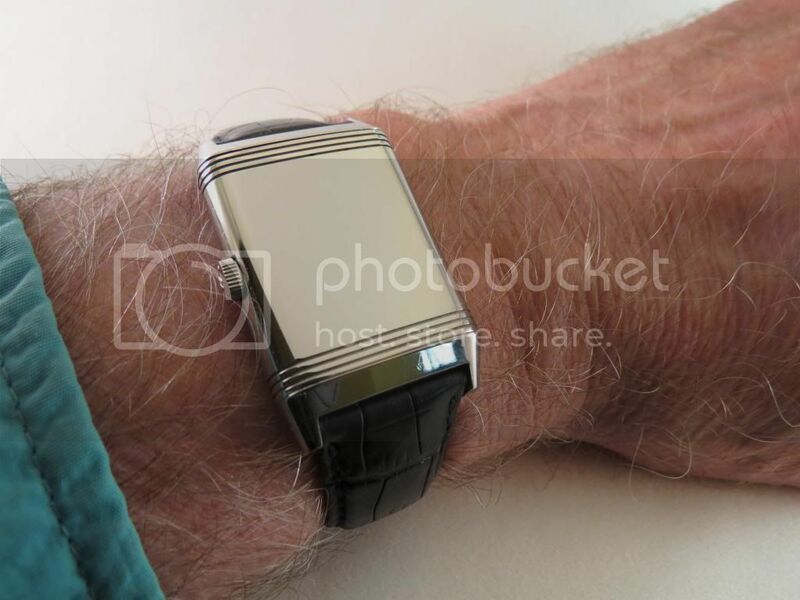 There's more to the story--the future of this particular watch. From the beginning of the New Year's resolution, the intent was to enhance this Reverso because it will eventually pass on to another much younger pilot I flew with in Fifteenth Air Force. My thanks to J C Randell for creating this bespoke masterpiece.